Hearing protection has been a requirement in the workplace for decades, with the result that many a worker's hearing has been saved from damage. Today's workers can enjoy their favorite tunes while still having their hearing protected. 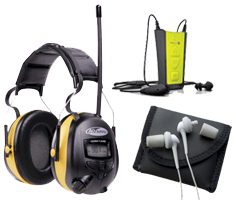 A wide and growing category of hearing protectors now enable the worker to plug in to virtually any portable music device including ipods, iphones, walkman, and cd players. In addition, many of these headsets, which include both ear muff and in-ear earphone styles, will also let you listen to scanners at the NASCAR racing venue or FMRS two-way radios used on the job, in construction and industry, as well as in hunting and other outdoor activities. Custom Musicians Monitors are absolutely the best in-ear earphones for live music monitoring available anywhere. Each pair of these full-custom monitors is specially crafted to fit your unique ears, providing truly unbeatable comfort and sound quality. These are the in-ear musicians monitors the pros choose, and so do audiophiles in the know. If you love your music, you deserve a set of custom musicians monitors!